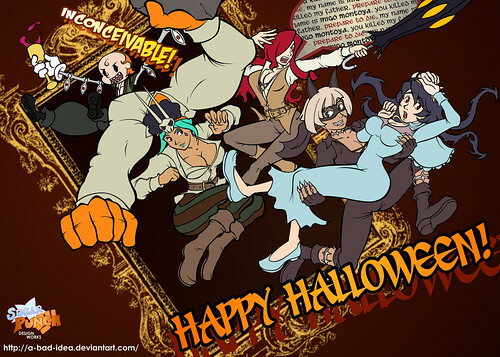 Halloween has always been a good fit with Skullgirls‘ macabre characters and “dark deco” aesthetic, so we decided we’d do something a little special with Fan Art Friday for Halloween. And more special than just delaying it until Monday. We asked our awesome clean-up artists to submit Halloween-inspired “official” fan art, and we got a lot of takers! 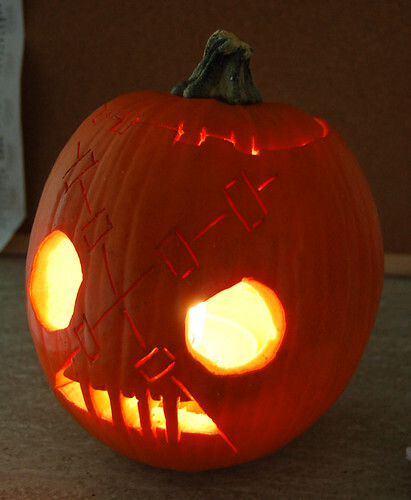 The Painwheel jack o’ lantern is sure to become a Halloween classic, thanks to Severin. I don’t know why Chris decided to dress all our characters up as Princess Bride characters, but I can’t argue with the results! 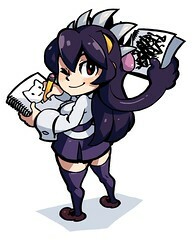 Ms. Fortune dresses up as an entirely different Catgirl in this great piece by Dustin. Laura thought it’d be funny if Cerebella and Vice-Versa dressed up as each other, and we agree. 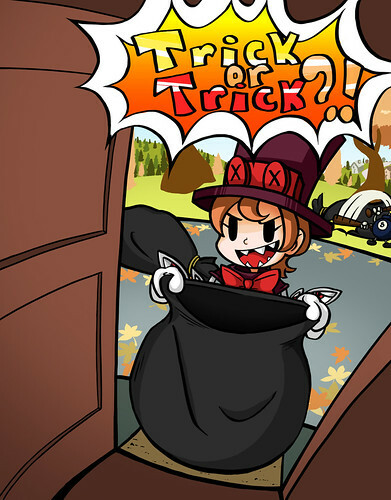 Ms. Fortune trick-or-treats as Filia in this awesome piece by Eric. Peacocks kindly asks you for candy in this stylish piece by Brett. 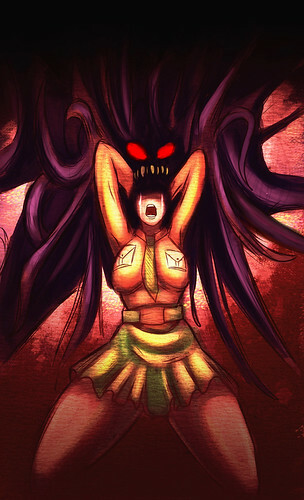 Ricky went with a scarier angle, and this chilling piece depicts Filia and Samson’s initial merging. Juliene also went with the trick-or-treat angle with Peacock, but ran with her Throw attack instead. 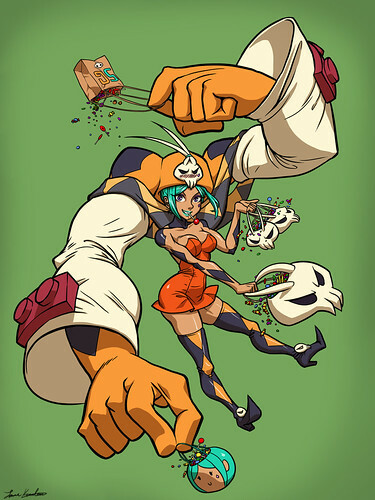 Cerebella and Vice-Versa get it on like Donkey Kong in this great piece by Cory. Those are really amazing. 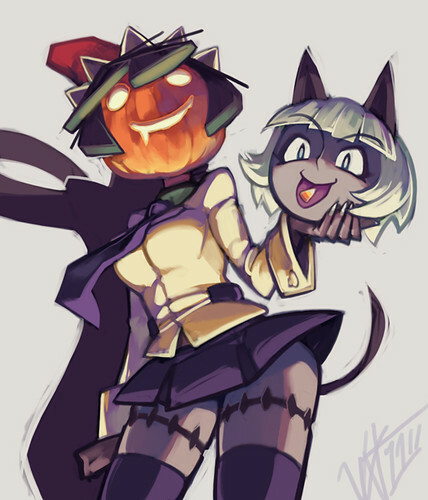 I’m digging Ms Fortune dressing as Filia and Peacock’s first trick-or-treat picture (though the second one is adorable in its own way… let’s hope that’s not her level 3 super). 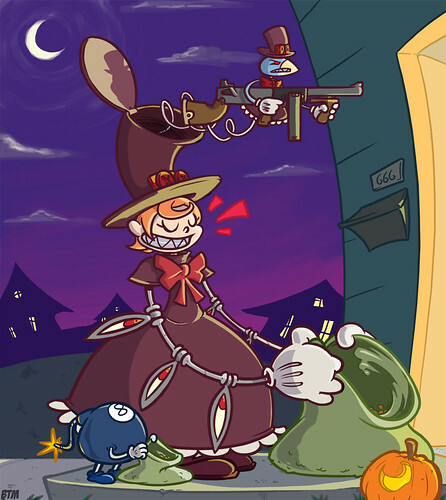 Someone should Dress as Peacock for holloween. Princess Bride and Skullgirls? IN ONE PICTURE!? The greatness is too much to handle! “Cerebella and Vice-Versa get it on like Donkey Kong”. I love the piece with Peacock “politely” asking for candy. Best. Peacock. Fan. Art. EVAH!!! Love the “polite” Peacock picture, though we can all say she is only 13 let her do some trick & treating.